Rearmed contra “Comandante Jahob” declared war on the government. 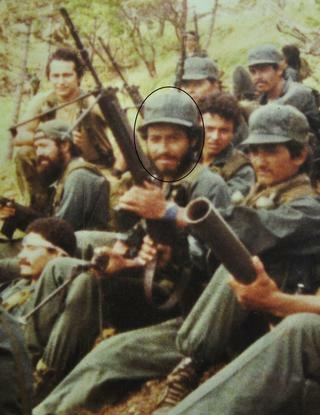 The ghosts of a counterrevolutionary insurgency were awakened this year when former contra special forces commander José Gabriel Garmendia, known by the codename “Comandante Jahob,” returned to the mountains in July and declared war on President Daniel Ortega, promising to remove the president from office “with bullets” if Ortega refuses to step down when his term ends in January 2012. “I am prepared to be a guerrilla fighter, I am prepared from a political-military point of view to confront the Army,” said Jahob, who was reportedly trained in sabotage and espionage by the Argentines and CIA in the 1980s. Jahob’s alleged rebellion had not produced any military actions by the end of the year. His whereabouts, true intentions and number of followers remains unknown. Posted in death squads, How Do We Build the Resistance?, idiot nation, image of the beast, The Most Moral Army In the World? After spending nine days in a medically-induced coma andundergoing multiple operations, Kommersant journalist Oleg Kashin is thankfully on his way to a strong recovery. After a brutal beating on November 6 that left him with skull fractures, broken shins and a set of maimed fingers, Kashin is well enough to walk on crutches and joke about flirting with his nurses in Moscow Hospital No. 36. In an interview with television personality Leonid Parfenov, Kashin said he has no idea who ordered his beating, that his assailants said nothing during the attack, and that a variety of the topics of his articles could have been motivating factors. But which one it was – the Khimki Forest, Kremlin-sponsored youth groups, or insulted Russian governors – Kashin couldn’t say. An investigation under the supervision of prosecutor general is still ongoing. In his first article since the attack, Oleg Kashin reveals that, far from embodying the glorified image of a fearless crusader that developed while he lay unconscious, the Kommersant journalist wishes most of all to simply go on with his work as usual. That, and to get rid of the feeding tube stuck up his nose. An unfamiliar man in a white coat took an instinctive step to the side, and my hand, stretching towards his chest pocket, grasping only air, falls back again to the mattress. “What does he want?” asks the man, feeling his pocket. “The pen, probably,” posed a woman’s voice; and that woman, who I didn’t see, was right: the pen, of course, I needed the pen. The blue gel pen from the chest pocket of the white coat of that man. “A writer,” the man with the pen said respectfully – but he did not give me the pen. Discussing the amusing incident, the entire delegation took off, leaving me alone with the artificial ventilation lung that went through a special hole made in my throat. The hole was made lower than the vocal chords; therefore, even after regaining consciousness, I couldn’t speak. Seeing the pen in the doctor’s pocket, I would have been thrilled to take the pen and, at least on my own bandaged hand, write: “It itches under the cast!!!!! !” – they would read it and help, scratch it with something. And instead of that – the backs recede in their white coats, and there’s no help at all. At that point I still didn’t know that one of the backs belonged to a paid agent of the LifeNews publication – the resident resuscitation expert (I exposed him a week later), and who, several hours later and under the heading “Braveheart,” told how I demanded a pen and paper in order to begin, even while still attached to an artificial breathing machine, to write the horrible truth about the people behind the attack on me. In the resuscitation ward, wrapped in tubes and wires, I could sleep (and slept) as much as necessary in any form, whether artificially medicated or healthily and naturally. I could keep quiet, I could (from the ninth day onwards) speak and, even while I couldn’t talk, still resolved the communication problem: a childrens chalkboard, left behind by someone, was found, and by drawing a rectangle with my hands in the air – a conventional gesture that everyone immediately understood for some reason – I could write what I was concerned about and what I wanted on this board. Only, I didn’t need to write about the itchy cast; they removed it faster than the board turned up. Therefore, the main topics of my notes were complaints about the probe in my nose – they fed me through the nose with some kind of special food – and flirting with the nurses. My life in those days, any way you look at it, was interesting and fascinating. But aside from me personally – yes and the doctors and nurses as well – who knew about this life? Nobody knew. My real life was happening, maybe, a half-hour drive from the hospital. Outside of the police office at Petrovka, switching places with one another, my friends and former enemies stood in solitary pickets with posters of my name, having suddenly become friends (I say this without irony; enemies may sometimes seriously become friends). A newspaper called “Kashin,” completely devoted to me, was printed. On Pushkin Square, and afterwards on Chistie Prudy, rallies were held in my defense. “Do you want the classic Kashin or the one with his signature?” girls politely asked a line of pensioners waiting for my portrait, which they could attach to their chests. The term “Journalist Kashin” appeared in President Medvedev’s lexicon. When a group of students in the journalism department at Moscow State University, locked in a classroom with windows facing the Kremlin, hung a poster out the window reading “Who beat Kashin?” a joke started going around: Dmitri Medvedev barricaded himself in his office, with windows facing the journalism department, and hung a poster out the window: “It wasn’t me!” – the joke is from Twitter, but who could guarantee that it didn’t really happen? The events in the week after my beating proved it: anything is possible, anything in general. The universal childhood dream, not to die but to be at one’s own funeral and hear who says what and how, came true for me alone. “Oleg, you’re going to wake up and be stunned!” – a phrase from the book of honorable recordings from a routine Kashin rally. And it’s true, I woke up and was stunned. Journalist Kashin – that is to say, I – quietly came to in the resuscitation ward. 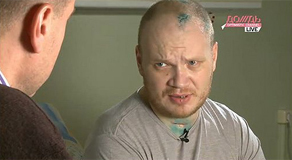 A half-hour drive away from me, somebody was going on a rampage, somebody who even people who knew me personally were ready to take for Journalist Kashin, brave and uncompromising, personally presenting a threat to the Kremlin, as well as hope for freedom and happiness. “Kashin, get up! Kashin, write!” cried the square. The square didn’t know that I was already up in bed and was writing on the board: “I want to go to the bathroom.” The tabloids quoted Journalist Kashin (but not me): “They will not silence me!” – unfortunately, without indicating what topic Journalist Kashin wanted to have his say on. There was only one thing that interested me at the end of the second week after the attack. There was once a handsome young pilot named Gagarin. He was somehow chosen to be astronaut number one, and at the age of 27, or something, he flew into space for a bit more than an hour. He came back – and that was it, there was no more life, just presidiums, banquets, presentations that stamped the impending doom onto his handsome young face. This went on for seven years before he died for good. I lay in the resuscitation ward, flipped through the “Kashin” newspaper, and thought about Gagarin and how we are alike. But I have one important advantage over Gagarin. The New Year’s recess – a terrific, as I understand now, invention. December is now beginning, I’ll likely be ill the whole time, and then the country will start to drink. We’ll return to work together, the country after the holidays and myself after rehab. Nobody will remember. Nobody will notice. And it will be normal, like before, to work. After all, they will not silence me. Russian Prime Minister Vladimir Putin pointed at the Soviet model as an example of how various ethnic groups can have friendly ties, drawing a quick retort Monday from the president in a rare sign of friction between the two leaders. Putin’s protege and successor as president, Dmitry Medvedev, countered him by saying that the Soviet experience wasn’t exactly a positive one and it can’t be repeated, adding that Russia may learn from the U.S. experience. The public exchange will likely fuel speculation about tensions between the two leaders as the nation approaches the 2012 presidential election. Putin and Medvedev have denied any rift between them and said they would decide who would run for president in 2012 so that they don’t compete against each other. Most observers expect that Putin, who remains Russia’s most powerful figure, will reclaim the presidency. Speaking at a Kremlin meeting focused on ways to assuage ethnic tensions that spilled into the open during riots outside the Kremlin on Dec. 11, Putin said that Russia has failed to learn from the Soviet experience and called for cultivating Russian patriotism. Speaking immediately after him, Medvedev said that the Soviet experience can’t be reproduced. “We need to work out new approaches,” Medvedev said. During the Dec. 11 riots, soccer fans and racists chanting “Russia for Russians!” clashed with police and beat members of ethnic minority groups from the Caucasus region. The violence in Moscow raised doubts about the government’s ability to control a rising tide of xenophobia, which threatens the country’s existence. While ethnic Russians make up four-fifths of Russia’s population of 142 million, the country is also home to about 180 ethnic groups. The Caucasus region, with its mountainous terrain and isolated valleys, hosts at least 100 ethnicities including Chechens, who have waged two separatist wars against Moscow after the 1991 collapse of the Soviet Union. Putin suggested Monday that the authorities might restore harsh Soviet era-restrictions on movement into big cities like Moscow or St. Petersburg. Such a move would target dark-complexioned people from the Caucasus, who flee their impoverished regions for big cities. “We went for liberal rules of registration too early,” Putin said. Medvedev warned that ethnic tensions could break Russia up if the government fails to stem violent nationalism and act more harshly to disperse riots. Putin also suggested limiting jury trials, introduced all over Russia in recent years. He said that trials by jury for suspects in murders and other grave crimes should only be held on an inter-region level instead of a local level to prevent acquittals based on clan loyalties. Medvedev has been markedly more critical about the Soviet past, trying to cater to a more liberal and educated part of the electorate and improve Russia’s image in the West. But differences between the two leaders are mostly limited to style and Medvedev so far has acted as a loyal placeholder for Putin. Nikolai Petrov of the Carnegie Endowment’s Moscow office suggested that Monday’s exchange between the two leaders could be aimed to distract attention from a second trial of jailed oil tycoon Mikhail Khodorkovsky. The judge on Monday declared Khodorkovsky guilty of theft in a verdict that could keep the tycoon behind bars for years to prevent him from challenging Putin’s power. DERA ISMAIL KHAN: The Pakistani Taliban defied an ongoing military offensive and kidnapped 23 tribesmen who had met with army chief General Ashfaq Kayani during a recent trip to the area, intelligence officials, tribal elders and the terrorists’ spokesman said. Intelligence officials and a local government official said 23 elders from the district of South Waziristan were summoned by the Taliban to Razmak, a town in North Waziristan, on December 17 and have not returned. “Our reports say that they had been detained by Taliban,” a tribal administration official said. The kidnappings further threaten the government’s shaky effort to convince hundreds of thousands of displaced members of the Mehsud tribe that the Taliban are defeated and that it is safe to return to their homes in South Waziristan. Taliban courts in South Waziristan are deciding how to punish the men and boys being held, and should have a “verdict” within days, Pakistani Taliban spokesman Azam Tariq told The Associated Press. “This is a warning to the tribal people to not come to the area because we are still present in South Waziristan,” Tariq said via phone. He claimed that seven Taliban courts were functioning in South Waziristan, as well as 22 offices. “On one side, the government says peace is established in South Waziristan, and on the other our tribesmen are being kidnapped,” said Maulana Esamuddin Mehsud, one of two Mehsud tribal leaders who said they learned of the kidnappings from the victims’ relatives. The 23, who include several students, were among those who attended functions with General Kayani in the Ladha and Makeen areas of South Waziristan on December 7. Posted in How Do We Build the Resistance?, image of the beast, Pakistani surrender, UnIslamic "Islamists"
[Pakistan has fully embraced the American solution to “self-defense” against the Taliban militants, local “self-defense forces”, a.k.a., “death squads.” Following the line laid-down by the Western media, readers are urged to compare Pakistan’s situation to that which developed in Iraq with the “awakening movement.” It is easy to see from Iraq’s experience with the paramilitary forces the great dangers that could arise from a failed militia movement, but it is imperative that Pakistani leaders look to earlier successful examples of this American “low-intensity conflict” solution, such as Colombia, to see the far greater dangers that could arise from a successful paramilitary campaign. Colombia is now entangled in an attempt to “demobilize” some 33,000 militia forces without destroying the state in the process. It is easy to accept rivers of American cash and weaponry to create paramilitary forces, according to American instructions, but it much more difficult, if not impossible, to disband these groups of armed thugs after they have murdered most of the leaders of the opposition. If Colombia’s history is not compelling enough to dissuade Pakistan from embracing the American paramilitary solution, then it should look back even further to the creation of the paramilitary Mujahedeen in Afghanistan, to see the permanent nature of the problems that these criminal groups create. If the “911 Truth” crowd would devote a little of their limitless energies to exposing these ongoing convenient “coincidences” of the Empire, then they would arrive at the same destination they seek, only they would get there a lot quicker. Militias stem Pakistani Taliban, but at what cost? MATANI: Tribal militias allied with the government helped block a Taliban advance in this corner of northwest Pakistan close to the Afghan border, but their success has come at a price: the empowerment of untrained, unaccountable private armies that could yet emerge as a threat of their own. Tensions are emerging between authorities and the dozens of militias that they helped to create predominantly in and near the northwest tribal regions. Operating from fortress-like compounds with anti-aircraft guns on the roofs, the militiamen have made it clear that the state now owes them for their sacrifices. They show photos on their cell phones of Taliban they killed and point to the scrubland outside, with graves of relatives who died in the fight. The leader of the largest militia near the town of Matani, a wealthy landowner named Dilawar Khan, warns that he will stop cooperating with police unless he gets more money and weapons from authorities. Speaking to The Associated Press, he adds what could be a veiled threat to join terrorists. “Time and time again, the Taliban have contacted us, urging us to change sides,” he said. Another local militia commander is locked in a dispute with local police, who recently raided his compound and accused him of stealing and overstepping his authority. The experience in the Matani area – 12 miles from Peshawar, shows the advantages of using proxies to counter al Qaeda and the Taliban, but also the pitfalls. In Iraq, similar forces were credited with creating a turning point in the war, when Sunni tribes rose up against al Qaeda and other Sunni insurgent groups. Many of those Iraqi Sunnis, however, now feel they are being marginalised by the Shia leadership. In Afghanistan, the United States is backing the creation of militias, dubbed local village defence forces, to fight the Taliban. The Afghan government is less keen, having seen the damage that warlords with private armies did to the country in the 1990s. Pakistan’s own past shows the hazards of proxies. A large part of the insurgency tearing at the heart of Pakistan today is made up of armed groups that the government trained and funded to fight wars in Afghanistan and against Indian forces in Indian-held Kashmir, as well as extremists they long tolerated to keep control in places like the Swat valley. Pakistani support for militias, known as lashkars, is less widespread and organised than in Iraq. Most operate in the tribal regions close to Afghanistan, where the raising of private armies has a history going back to British colonial times. The army and political authorities dole out money and arms to tribal leaders so their fighters hold areas retaken by the military. Terrorists have ruthlessly targeted the lashkars this year with suicide bombings aimed at their meetings with authorities. The northwest region is also where the al Qaeda’s top leaders are thought to be hiding and is increasingly being targeted by US missile strikes from drone aircraft, particularly in North Waziristan. Six suspected US missiles struck two vehicles in the Shera Tala village of North Waziristan on Monday, killing 18 alleged terrorists, intelligence officials said. The Matani area represents one of the most successful uses of the lashkars. A year and half ago, the poor, hilly region was under the effective control of terrorists who moved in from the adjacent tribal region of Khyber and enforced their will on the population. This year, the Taliban were largely pushed back from Matani, and while no one is claiming total victory, attacks are down by three-quarters in Peshawar, police and locals say. The army has also undertaken operations in other parts of the tribal regions against known terrorist strongholds, further squeezing them, while the US has increased drone-fired missile attacks. “The militants’ backbone is broken,” claimed Peshawar city police chief, Liaqat Ali Khan. Three tribal militias in Matani backed by the government played a vital role in pushing back the Taliban and continue to ensure the terrorists do not return in significant numbers, said Matani police officer Hidayat Khan. The tribesmen make good proxies because they know the terrain, have a network of contacts in the area and are motivated to fight terrorists, who in some cases have killed their relatives. Each lashkar is typically made up of an extended family or tribe, strengthening their loyalty. Dilawar Khan claims to have between 300 and 400 men in his lashkar – and he boasts that he can call up “an entire village” if he wants. His forces have stocks of grenades and rockets, along with automatic weapons. His walled compound, on a hill at the end of a newly paved road, has three Russian-made anti-aircraft guns and a 100-foot-high (30-metre) watchtower that gives him a view across the hills to Khyber. Colombian President Juan Manuel Santos, who was inaugurated Aug. 7 and has taken his country by storm with a wide array of new initiatives, spoke to The Post’s Juan Forero on Dec. 6 in New York and again on Dec. 10 in the Colombian capital, Bogota. Q: You and President Hugo Chavez of Venezuela had been bitter rivals. How did you change that relationship? A: I told Chavez from the beginning: "Let’s not pretend to change each other’s minds. We think very differently on many aspects but let’s respect our differences, and if we respect our differences we can have cordial relations, and that is in the best interest of both the Venezuelans and the Colombians." And that is what I have been doing, establishing a cordial relationship under the understanding that he doesn’t mingle in our internal affairs and vice versa. Q: What did you get out of this new relationship? A: So far we have done very well in the sense that we have been starting to collaborate on aspects that for us Colombians are very important. We started having trade, he started paying our exporters, he started collaborating in security issues and for the first time he has helped us recover a couple of kidnapped people that were taken to Venezuela. Q: You also immediately began to try to reestablish relations across the continent, though your closest ally is the United States. What’s your strategy? A: I have had extremely good relations with the United States and with both parties (Republicans and Democrats), and I hope to continue to have these good relations, which I, again repeating, do not consider to be mutually exclusive with having good relations with Venezuela or Ecuador or whichever country in South America. And as a matter of fact, President Obama, Secretary Clinton and many members of Congress have celebrated that we have improved our relations with Venezuela and with Ecuador. Q: You speak of "enhancing" the relationship with the U.S., which has long been defined by the war on drugs. What do you mean? Q: You were defense minister in Uribe’s government but are taking a different path as president. Did you not support his policies? A: Uribe and I have very good relations. I owe him loyalty, I admire him, he did great things for our country, and I think that because of what he did, I can now concentrate on different issues, different from what he concentrated on. Q: The Colombia congress has been busy since you took office. What initiatives are you hoping to push through? A: In these first four months, the congress is approving reforms that nobody ever imagined were going to be even presented, and we not only presented the reforms but they have been approved by congress and with an overwhelming majority. Reforms on royalties, for example, something almost impossible a couple of years ago. This law that is going to allow us to restitute the land to the peasants that were displaced by the illegal groups, or another law that is going to repair [through compensation] the millions of victims that have suffered more than four decades of violence. Q: Your predecessor, President Uribe, fought with the Supreme Court and criticized its rulings. Was that damaging to democracy and how important do you see the separation of powers? A: Of course it was damaging the democracy. . . . Democracy is like three oxen pulling a plough. The oxen are the independent powers, but you have to walk in the same direction; otherwise, you cannot plough and that is what was happening in Colombia. One ox was walking in one direction, the other in another direction, so the democracy was not working. The very first step I took was to reestablish relationships with the judicial power, respecting its independence but reestablishing good relations. Q: What worries do you have about the drug war? A: There are some fundamental structural contradictions in this war on drugs. . . . We in Colombia have been successful, but our success is hurting the whole of Central America, Mexico, the Caribbean, Africa, and eventually it will backfire on us again. So are we pursuing the correct long-term policy? Q: So is legalization of drugs an alternative? A: I don’t object to discussing any alternatives, but if we are going to discuss alternatives, let’s discuss every alternative. Of course, I am not going to be stupid enough to propose legalization by myself, as a country, but let’s discuss what alternatives do we have – what is the cost, what is the benefit of each alternative? Q: Are you looking more toward Asia, as are other Latin American countries? A: We depend too much on the U.S., as we depend too much on Venezuela, but that doesn’t mean that we don’t give a tremendous importance to the U.S. The fact that we are looking to China and Asia is simply the reflection of reality. China is becoming an engine of growth, and we want to participate in that growth. Touted project of Trans-Afghan pipeline has satisfied only the political ambitions of Ashgabat, analysts say NBCA. December 11 in Ashgabat, the signing of the quadripartite intergovernmental agreement on the project to build the Turkmenistan-Afghanistan-Pakistan-India (TAPI). If the pipe length of 1,680 kilometers will be built it will provide annual deliveries in the amount of 33 billion cubic meters of natural gas. Despite such optimistic statements by the leader of the oil and gas rich country, the high risks in the project by more than obvious, experts say. Firstly, it is the instability in Afghanistan, where there will be little willing to invest in the construction of the pipe. NBCA experts do not advise to take the signing of an agreement on the construction of pipes, as the real beginning of the project. They point out that not once signed the contract that were never translated into reality. Some commentators believe that such lobbying TAPI pipeline project, the official Ashgabat, is trying to create competition among buyers of its gas and push them towards the early realization of other, more realistic ideas. “Berdymukhammedov hopes for the creation of alternative transport corridors to export its own gas, and TAPI can become just such an alternative – said Rovshan Ibrahimov, doctor of political sciences from Baku .- In addition, the signing of the contract and can accelerate the realization of other pipelines. It’s – Frozen Caspian project pipeline or Trans-Caspian pipeline, which interested countries and companies-members of the consortium for the construction of Nabucco. Turkmen leader is trying to diversify its energy dependence on Russia as Gazprom is worth a lot of nerves. Two months ago, the Kremlin announced that it has no plans to increase imports of Turkmen gas, and will continue in 2011 to buy 10 billion cubic meters instead of the previously imported 40-50 billion in bad news and was freeze project to build the Caspian pipeline. Berdymukhammedov has repeatedly proposed sale of gas at the border, regularly appealed to the international community to take measures to ensure the safe transit of energy, expressed consent for the construction of Caspian pipelines without addressing the issue of delimitation of the Caspian Sea. “This president wants to protect himself – says a commentator on politics pipeline in Ashgabat. – He suggests that interested in obtaining energy part, must take risks for the construction, transportation, and if you want to re-export in any form. He wants international guarantees . Commentator as an example, led pipeline project of the Baku-Tbilisi-Ceyhan oil pipeline, after the launch of which Azerbaijan has emerged from Russia’s influence, and now pursues an independent policy in the energy sector. An official from the Foreign Ministry of Turkmenistan, be helped to remain anonymous, said the NBCA, that agreement on TAPI, “seamlessly fit” into the idea of the settlement of intra-Berdymukhammedov problem. “The president believes that the military used the model permits the Afghan conflict is hopeless and therefore initiates a non-military methods of solving problems, among them, and TAPI”, – stressed the official. This article was prepared under the project “News Briefing Central Asia”, funded by the National Endowment for Democracy.